You’ve probably been hearing more and more about essential oils, one of the biggest trends in natural health for people and, increasingly, for pets. The oils can be used for mood and aromatherapy, for minor skin wounds, and as insecticide aids. There are several big companies that produce these oils, with varying degrees of quality control. As with many natural therapies or supplements, keep in mind that essential oils are not approved by the FDA for medical use with pets, and there is no regulated difference between oils labeled “therapeutic grade” and others. Why are we so concerned about essential oils and cats, anyway? There is a specific enzyme produced by the liver that is important for metabolizing certain compounds and cats do not produce this enzyme. This makes them incredibly sensitive to drug and chemical toxicities, not just natural therapies. There are multiple ways that your cat can be exposed to oils. They can ingest the oils orally and absorb the oils rapidly through their skin; cats can also be particularly sensitive to respiratory exposure through oil diffusers. It’s important to remember that oils can be very concentrated, so even just a few drops applied to your cat’s skin can be a huge amount of the oil itself. And don’t forget how flexible your cat is! Anything applied to your cat’s skin has the risk of being licked off as your cat grooms their coat. 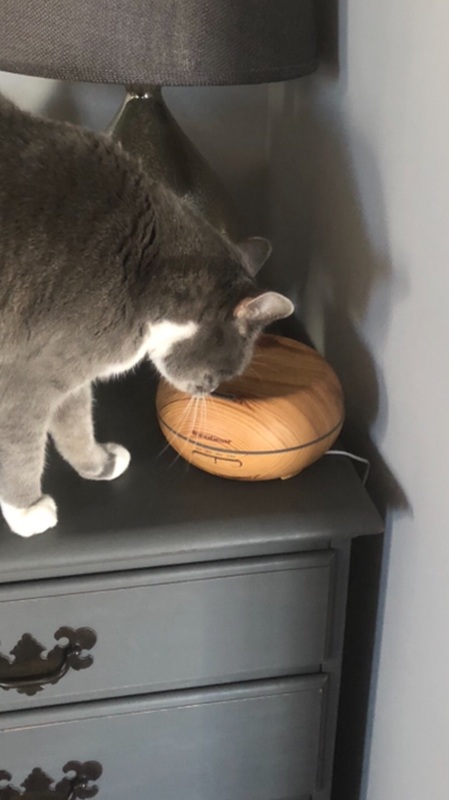 When diffusing oil in your home, always make sure that your cat has the option to leave the room that the oil is being diffused in. It’s a good idea to avoid active diffusers – those with motorized fans that actively push the essential oil out into the room. Passive diffusers, like reed diffusers, warmers with no fans, or jewelry diffusers are less worrisome, as the concentration of the oil into the surrounding area is much lower. Avoid diffusing oils where your cat eats, drinks, or has their litter box. There are some specific oils that are not to be used with cats, period. Wintergreen, tea tree, citrus, oil of sweet birch, pine oils, Ylang Ylang oil, peppermint oil, cinnamon oil, pennyroyal oil, clove oil, and eucalyptus oil. These have been shown to definitively cause toxicity in cats and should not be used with cats at all. Vomiting, drooling, lethargy, chemical-like burns to the skin, difficulty walking, muscle tremors, and respiratory distress can all indicate toxic exposure. *In many cases dogs can metabolize compounds more effectively than cats. However, very young puppies and dogs with liver disease cannot and caution should be used around these animals. In general, we recommend taking the same precautionary measures described above around all pets when using essential oils. Remember, most pets are naturally curious and will probably want to lick or sniff the diffuser and/or oils directly. Even a small lick can irrirate or burn your dog’s mouth! So, can we use essential oils safely with our pets? The answer is… maybe. There is a lot of unregulated use, but not a lot of scientific studies to show whether essential oils are beneficial to our pets. Though our recommendations may change, I would not encourage using essential oils for medical treatment for pets at this point. Using them in your home with safety in mind can be done effectively. We highly recommend consulting with your veterinarians before using any over-the-counter natural pet product. Many of these products appear to have the same compounds used in human aromatherapy products. And it is important to note, that the essential oils found pet products are greatly diluted. So succesfully using a product containing an essential oil, is not the same as applying the oil directly to your pet! If you use essential oils in your home, be careful with your pets, especially your cats. Avoid applying it to their skin and take measures to insure your cats can easily avoid diffused oils at their will, and never allow ingestion of oils. If you think your cat may have been exposed to something toxic, call Leesburg Veterinary Hospital or the Pet Poison Hotline as soon as possible. Leesburg Veterinary Hospital’s Dr. Erin Rockwell contributed to this article. ← Case Study Analysis: A pup’s accidental ingestion of human medications.